Linda Rohr and Amy Parr Cilmi with their tablescape for the Homes for the Holidays fundraiser for Post 53 at Nielsen's Florist recently. "Home for the Holidays" at Nielsen's Florist recently raised more than $4,000 to benefit Darien EMS-Post 53, the local volunteer emergency medical service. 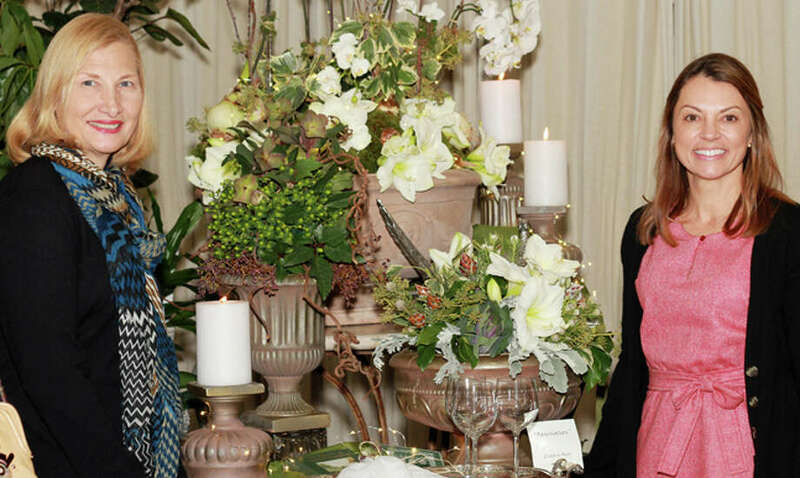 Caroline Nelson, the post's senior and fundraising officer, said, "Nielsen's graciously hosted our annual fundraiser in their garden conservatory for the second year in a row. It was a perfect night to kickoff the holidays, to shop Nielsen's fine collection of holiday decor and to help raise funding to support our Post 53 mission." The event featured a collection of holiday displays as shoppers browsed and enjoyed wine and hors d'oeuvres . There also was a raffle. Ticket proceeds and 10 percent of the evening's sales benefited Post 53. "Darien EMS-Post 53 is a perfect example of the heart and soul of this community. Nielsen's is proud to support their important work to provide emergency medical services to our community, while empowering and educating young adults. We are also grateful to our customers and to the event participant's for such a successful evening," Sandy Nielsen, general manager of Nielsen's Florist, said in a press release on the event. Darien EMS-Post 53, founded in 1970, provides emergency medical services to the community with Darien High School students and adult volunteers. The Post 53 volunteers staff three state-of-the-art ambulances 24 hours a day, 365 days a year. For more information, visit www.post53.org.